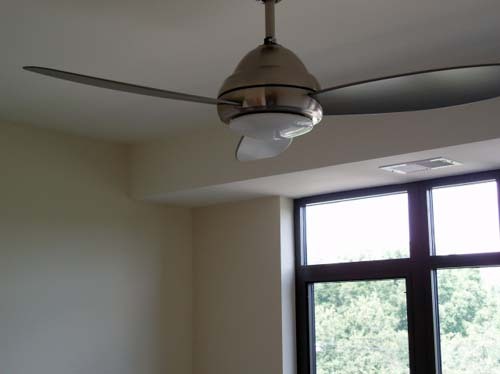 She opened her eyes and saw the blurry, motionless, ceiling fan. At first, without her seeing apparatus and still hazy from the sleeping pills she took, she thought it was some sort of sign, but then she remembered it was just a ceiling fan. The cat was stretched out to full length on its back at the foot of the bed, taking up far more room than a domestic house cat ever should. He looked like some sort of furry meatloaf. She could feel his warmth against her right foot. Stupid cat, she thought. The pang that hit her every morning, that she is unemployed and really has no reason to get out of bed at all, hit her again today. Then she remembered it was Saturday and she didn’t have to feel guilty about being without purpose for the next two days. It was the weekend. She wondered what she should do with herself today. Nothing came to mind. There was really nothing she had to accomplish. These days, there wasn’t anything she had to do at all and she hated that. She had been inventing things to do, but the strain of the nothing was wearing on her. She hated being purposeless. She wondered what time it was. Time held no meaning for her, but she liked to pretend that she wasn’t temporally unmoored, that the day and the time still had a significance. She looked at the clock and saw the number nine on the left followed by a blinking colon and two other irrelevant numbers trailing behind. Ok, nine is reasonable, she thought. If the number had been lower than seven, she wouldn’t have gotten out of bed. She withdrew her feet from around the lazy feline, threw back the covers and searched out her fuzzy, leopard print slippers with her toes. She went into the bathroom to brush her teeth and pee like she always did first thing in the morning. It occurred to her that the bladder was a remarkable thing; it was able to store all that liquid for five or six hours while she slept, when normally, she had to pee every hour like clockwork. Her second task on any given morning was to go into the kitchen in search of caffeine. She started rinsing out the coffee pot. She got as far as pouring water into the coffeemaker when she remembered that she had drunk a bottle of wine the previous night. Even though she didn’t feel hung over in the slightest, she opted for a Rockstar Energy Drink instead. It was the best readily available remedy for a hangover that she’d found. It was the B-vitamins and the Milk Thistle extract. She kept two of them there in the fridge since she wasn’t always good about remembering to replace a cold one with a warm one. She needed a back up. She bought Rockstar by the case. She decided to have one preventatively instead of coffee. Sometimes, hangovers creep up on you after you’ve been awake for an hour or two. Maybe she could head it off at the pass. Besides, it was probably hot outside where she was headed next and an ice-cold beverage was preferable to a hot one. She went back into the bedroom to find the cat in the same position in which she had left him. She poked his upturned stomach with her finger. The cat knew her morning routine as well as she did. He knew there was nothing for him in either the bathroom or the kitchen. He had to wait for these steps to be accomplished before he was fed. She went to the closet where the cat food was stored. If she didn’t keep it out of the cat’s way, holes would be chewed in the bottom of the bag and the lazy beast would gorge himself. The cat was already fat enough. When the creaky door to the closet opened, the cat sprang off the bed. Food was the only worthy reason to leave his repose. When she had a job, the cat’s laziness irked her. When she had to drag herself out of bed to go to work, he would just lie there, gloating. But now, she and the cat shared the same circumstances. Neither of them really had a reason to get out of bed first thing in the morning. With an empty bladder and a cold Rockstar in hand, she grabbed her laptop and went outside. It was already hot at nine-something AM. She wouldn’t be able to sit out there for long. She cracked the Rockstar and the laptop, and began reading the short story she had been working on the day before. She cringed. 2,735 words of crap. It wasn’t good enough. She decided to wait on that until she had finished drinking the Rockstar and the caffeine had saturated her brain. She set it aside and began perusing her usual internet haunts. She had another long day of nothing ahead of her. Posted in misc. business and tagged autobiographical fiction, boredom, hangovers, misc. business, pets, Unemployment. Bookmark the permalink. you have described the exhaustion of being unemployed so well! I felt very similarly when it happened to me, and the weekend meant I wasn’t the only one at home. If this is your actual situation, I hope you find what you need soon. Thank you for all your contributions here. They are a pleasure to read.